My THIRD kit is complete! « A new designer for me, a new kit, and a quickpage for you! For the challenge we were only permitted to create 6 papers and 8 elements, so I of course createad more than that LOL. Later this week make sure you return for an add-on to this kit! 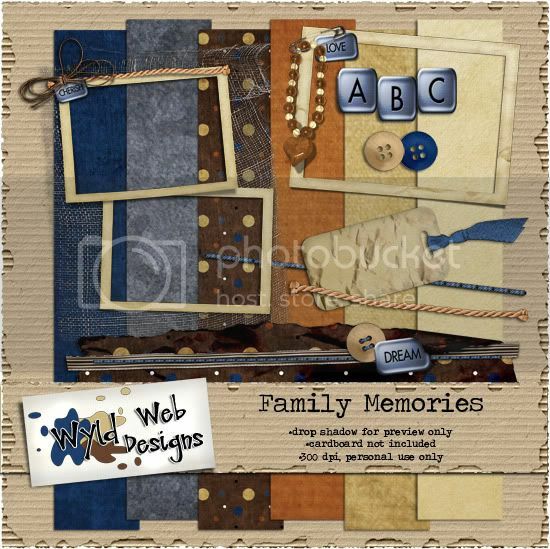 If you make a layout with the kit this week, please stop by Brownie Scraps and upload your layout, you could win a gift certificate to their fabulous store! Thanks for stopping by and please leave some love if you download! Charmaine! This is wonderful!! You did a fantastic job! This is awesome! I love the colors and the theme:) There is a page on my blog! Where do I post it at Brownie? I see lots of challenges but I don’t know which one this falls under, lol…all I can think of is eating when I’m on that site! LOL! You lose a lot less sleep over a kit too! It’s gorgeous hun! Off to fulfill my CT duties! Love the colors, love the textures, love the elements – thanks! I love this! It is hard to find cute stuff for boys that isn’t too cute (if you know what I mean). This is perfect!!! Will a full kit ever be for sale? What a great kit! And I must say — I love your blog layout and that there is so much space in the middle for your content. If you don’t mind sharing, I’d love some information on how you did this. My e-mail address is included above. What a great kit! Thank you so much!! This is too cool. I love the papers and colors. I love the rustic but “not all boy” feel. I have lots of pics of my dd’s fishing with Dad. This will be a wonderful addition to my memories. Thank you for making me look so good.